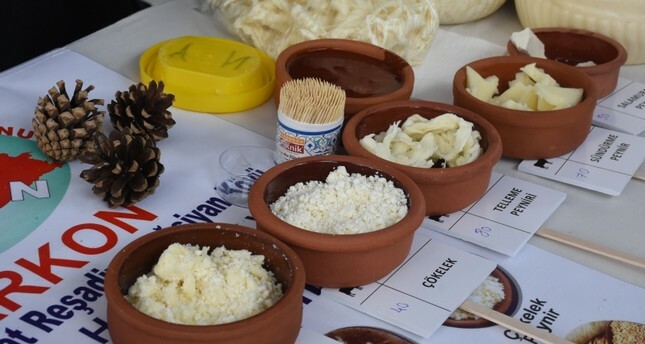 Various types of cheeses from Turkey's different regions are being introduced and promoted at the Third International Cheese Festival which began this week in southwestern Muğla province. The festival kicked off in the resort town of Bodrum for the third time with the participation of cheese producers from all over Turkey as well as abroad, including from Greece and Italy. Emine Türk, a member of the organizing community known as Slow Food Bodrum, told reporters that participation in the festival has exceeded their expectations, adding that cheese producers from the Greek islands and Italy will also introduce their products at the event. At the festival, which runs through April 14, Italian cheesemaker Mario Loffredo will demonstrate the process of making Italian mozzarella cheese. Türk told Anadolu Agency (AA) that Turkey is a top producer of cheese, noting, "A cheese very similar to the gorgonzola cheese made in Italy is being produced here, too." "We have cheese producers from Tokat, Konya, Çorum and Kırklareli… We want our foreign guests to see our cheese produced in Van, Tokat and Balıkesir," Türk said, listing provinces in central, western and southeastern Turkey and noting that cheese production across the country has improved. Ahsen Toktay, a producer from central Turkey's Karaman province who attended the festival to introduce their local tulum cheese said that they use natural fermentation in their production, noting that about 70% of the cheese is produced from sheep milk and 30% is from goat milk. Toktay said that the tulum cheese – a very sharp and salty cheese generally made of goat milk – matures for at least six months before reaching its ideal consistency. Toktay said that they have been receiving increased demand from abroad for the local specialty tulum cheese. Claudio Conte, a retired Italian pharmacist who is attending the festival, told AA that he liked the taste of Turkish cheeses very much, emphasizing that Turkish cheeses' taste is very similar to that of French cheeses.